Alexander Yevgenievich Volkov is a mixed martial artist born in October of 1988 in Moscow, Russia. He fights in the Heavyweight division of the UFC. He is the Ashihara Karate Champion of Moscow and three-time Pankration Champion. He has a black belt in Tsu Shin Gen, brown belt in Kyokushin Karate and a purple belt in BJJ. Alexander Volkov made his MMA debut in April of 2009 and had a total of five fights in his first year a a professional. He went 5-1 during ’09. 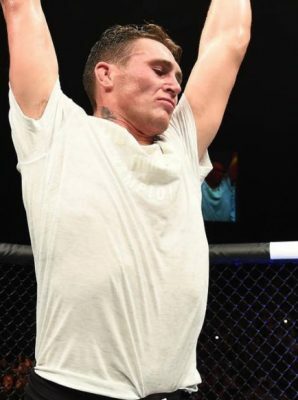 Next year he had six fights and went 4-2, and after winning five fights in 2011 he got the chance to face former UFC Heavyweight champion Ricco Rodriguez. They fought at BF – Baltic Challenge 3 and Volkov won by decision. He later got signed by Bellator MMA. He won his first three fights in Bellator MMA, a heavyweight tournament, and became the heavyweight champion. After losing his belt to Vitaly Minakov he entered another tournament and made it all the way to the finals. He fought twice outside Bellator MMA before coming back and losing two straight to Cheick Kongo and Tony Johnson. Alexander Volkov made his UFC debut in November of 2016. He fought Timothy Johnson and Roy Nelson in his first two bouts, winning both by decision. His next fight will be a main event in Rotterdam where he faces the Dutch giant Stefan “Skyscraper” Struve at UFC Fight Night: Struve vs. Volkov the 2nd of September.